Today the internet is quickly growing as a consumer market. Not all products are suited for online sales. Creating a product specifically for online sales requires some creative thinking. There are several steps in the process and this article will cover, choosing a product and creating a prototype. As you can see. 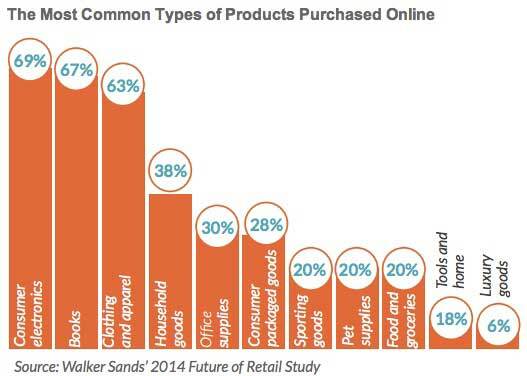 from the above chart, the top-selling online products are consumer electronics, books, and clothing/apparel. This kind of information gives you a good indication of where you might like to focus when thinking about creating your own online product to sell. If we look at one area of online sales, books, we can see there is a trend of increasing sales in electronic books and a decrease in print. 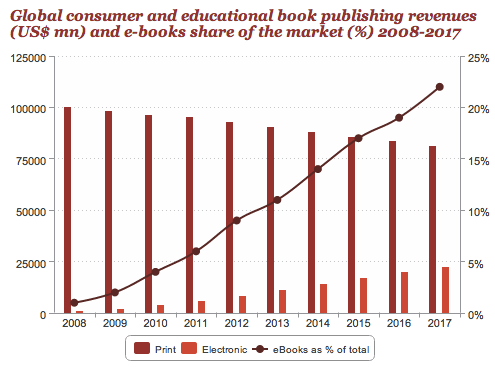 However the revenue from print books is still much higher then electronic. Based on this information I have decided to create and sell a card game online that has both a print and digital format. It’s a good idea to see what similar types of products are out there on the web for sale. It’s helpful to see what the price points are and how saturated the market is. I did a quick search on amazon to see what I could find for the type of game I was thinking about. My first idea is to create a productivity card game. I’m thinking that this could be a type of game that makes the every day chores in life more interesting. I’m reminded of Marry Poppins song lyrics, ‘A Spoon Full of Sugar Helps the Medicine go Down in the Most Delightful Way’. At first I started by writing down words as they came to my mind – anything and everything that related to recurring life tasks – on the cards with the black sharpie (typos and all). That task gave me a stack of cards with just a bunch of different words on them. I needed to have more patters of difference in the cards in order to make it more of a game. So I decided to break out the colored papered and separate the words into some type of category system. Much like a deck of cards has 4 suites. I ended up with a rainbow set of cards that I could put into different groups. I started to play with the cards. I put them all in the box and then pulled out one or two or three cards at a time. I put all the cards face up and started to group them by colors to find new types of patterns in the cards. I used the cards in my daily tasks for a few days. Each time getting more convinced that this was the type of game people would like to play. In the end I had a set of cards that could be grouped individually, fit into 1 of 3 major color sets, or fit in smaller groupings by specific paper type. Essentially I had my prototype and I was ready to share the game with other people. I shared my new prototype cards set with a couple close friends to see what they thought. I found that is was harder to explain the concept to another person and that the game was not as user-friendly as I had imagined. In conversations about the experience of the card game it became apparent that the user would have to be a relaxed, playful, and calm state to enjoy the game. It was not a great system for people in a goal oriented productive mood. I decided to take a turn, or pivot my concept, in the next version of the game.